Fort Lauderdale, Fla / May 29, 2014 - Rand Internet Marketing, a multi-service firm recently placed on South Florida Business Journal's Top 25 Website Design & Development Firms for the 3rd year in a row, has recently unveiled a Local Search and Directory Management Solution. As part of the rollout of the new Management Solution, Rand Internet Marketing created RandLocal, a service that allows business managers and owners to find out whether their businesses are listed in major local directories, and whether those listings are accurate. "We are in the business of helping businesses get noticed online," stated Seth Rand, Founder and CEO of Rand Internet Marketing. “Creating and maintaining a strong presence in Local Directory Listings is one of the most essential methods of connecting a business with customers. We a proud to provide a one-stop, affordable solution for businesses to get listed, get noticed, and get more customers through the door." As a part of the new RandLocal service, Rand Internet Marketing offers Directory Listing Submission and Enhancement services for as little as $79 a month. In order to utilize RandLocal, visit http://www.randlocal.com, and call (888)707-RAND for a professional assessment and consultation. 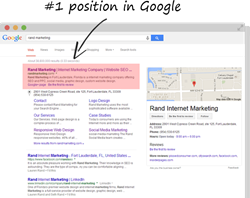 Rand Internet Marketing works with a wide array of businesses on a variety of online marketing services from Website Design to SEO, Social Media, and, of course, Directory Listings Management. Some of the clients benefitting from Rand Internet Marketing services include RealEstateAgent.com, Night Owl, Germ Warrior, Le Chocolatier, Southern Coast Roofing, 5i Solutions, Brooklyn Bag, Universal Fun Parties, Family Rentals, Carchex, The Printers Printer, Classic Marble Restoration, Florida Home Improvement Associates, and Al Hoffer, a South Florida pest control company.